The following Conditions of Sale and Terms of Guarantee are Sotheby's, Inc. and the Consignor's entire agreement with the purchaser and any bidders relative to the property listed in this e-catalogue. The Conditions of Sale, Terms of Guarantee, the glossary, if any, and all other contents of this e-catalogue are subject to amendment by us by the posting of such amendments on the Sotheby's website (www.sothebys.com) and the Invaluable website (www.invaluable.com). The property will be offered by us as agent for the Consignor, unless the e-catalogue indicates otherwise. By participating in any sale, you acknowledge that you are bound by these Conditions of Sale and Terms of Guarantee. Goods auctioned are often of some age. The authenticity of the Authorship (as defined below) of property listed in the e catalogue is guaranteed as stated in the Terms of Guarantee and except for the Limited Warranty contained therein, all property is sold "AS IS" without any representations or warranties by us or the Consignor as to merchantability, fitness for a particular purpose, the correctness of the e-catalogue or other description of the physical condition, size, quality, rarity, importance, medium, frame, provenance, exhibitions, literature or historical relevance of any property and no statement anywhere, whether oral or written, whether made in the e-catalogue, an advertisement, a bill of sale, or elsewhere, shall be deemed such a warranty, representation or assumption of liability. We and the Consignor make no representations and warranties, express or implied, as to whether the purchaser acquires any copyrights, including but not limited to, any reproduction rights in any property. We and the Consignor are not responsible for errors and omissions in the e-catalogue, glossary, or any supplemental material. Sotheby's will not be responsible or liable for damage to frames and glass coverings, regardless of the cause. Prospective bidders should inspect the property before bidding to determine its condition, size, and whether or not it has been repaired or restored. Where no exhibition is held for a timed auction, you may contact us to arrange inspection. A buyer's premium will be added to the hammer price and is payable by the purchaser as part of the total purchase price. The buyer's premium is 25% of the hammer price up to and including $300,000, 20% of any amount in excess of $300,000 up to and including $4,000,000, and 12.9% of any amount in excess of $4,000,000. We reserve the right to withdraw any property before, during and after the sale and shall have no liability whatsoever for such withdrawal. In order to bid, you must first register on the Sotheby's website or the Invaluable website. Sotheby's reserves the right, in our sole discretion, to refuse your registration or participation in the auction or to revoke your permission to participate before, during or after the sale. Bidders should also consult the Sotheby's Website or the Invaluable website for the most up to date cataloguing of the property in this e-catalogue. Bidders are responsible for making themselves aware of all available notices, which will be posted online. As soon as you place and confirm your bid amount, your bid is submitted. You accept and agree that bids submitted by you are final. Neither Sotheby's nor the Consignor is responsible for any errors in bidding. We reserve the right to reject any bid. The highest bidder acknowledged by the Sotheby's and Invaluable online bidding systems will be the purchaser. Sotheby's has absolute and sole discretion in the case of error or dispute with respect to bidding, and whether during or after the sale, to determine the successful bidder, to re-open the bidding, to cancel the sale or to re-offer and re-sell the item in dispute. If any dispute arises after the sale, our sale record is conclusive. Bids may be submitted from the start of the auction until bidding on the specific lot closes. An end time will be displayed for each lot on the lot detail page. Lots will close in one minute increments unless a bid is placed within 5 minutes of a lot's scheduled end time, in which case we will extend the sale of that lot by 5 minutes from the time of the last bid. The extension of any one lot's closing time does not affect any other lot's closing time; therefore, it is possible that lots will close out of numerical lot order. Subject to fulfillment of all of the conditions set forth herein, at the close of a lot, the contract between the consignor and the purchaser is concluded, and the winning bidder thereupon will immediately pay the full purchase price or such part as we may require. Title in a purchased lot will not pass until Sotheby's has received the full purchase price in cleared funds. The purchaser's obligation to immediately pay the full purchase price or such part as we may require is absolute and unconditional and is not subject to any defenses, setoffs or counterclaims of any kind whatsoever. Sotheby's is not obligated to release a lot to the purchaser until title to the lot has passed and any earlier release does not affect the passing of title or the Purchaser's unconditional obligation to pay the full purchase price. In addition to other remedies available to us by law, we reserve the right to impose from the date of sale a late charge of the annual percentage rate of Prime + 6% of the total purchase price if payment is not made in accordance with the conditions set forth herein. Please note Sotheby's reserves the right to refuse to accept payment from a source other than the buyer of record. Unless otherwise agreed by Sotheby's, all property must be removed from our premises by the purchaser at his expense not later than 30 calendar days following its sale. Purchasers are reminded that Sotheby's liability for loss of or damage to sold property shall cease upon the earlier of (a) 30 calendar days after the date of the auction and (b) our release of the property to the purchaser or the purchaser's designated agent. Upon the expiration of such 30 calendar day period or upon such earlier release, as applicable: (i) the purchaser bears full liability for any and all loss of or damage to the property; (ii) the purchaser releases Sotheby's, its affiliates, agents and warehouses from any and all liability and claims for loss of or damage to the property; and (iii) the purchaser agrees to indemnify and hold Sotheby's, its affiliates, agents and warehouses harmless from and against any and all liability for loss of or damage to property and any all claims related to loss of or damage to the property as of and from and after the time Sotheby's liability for loss or damage to the property ceases in accordance with this paragraph. If any applicable conditions herein are not complied with by the purchaser, the purchaser will be in default and in addition to any and all other remedies available to us and the Consignor by law, including, without limitation, the right to hold the purchaser liable for the total purchase price, including all fees, charges and expenses more fully set forth herein, we, at our option, may (x) cancel the sale of that, or any other lot or lots sold to the defaulting purchaser at the same or any other auction, retaining as liquidated damages all payments made by the purchaser, or (y) resell the purchased property, whether at public auction or by private sale, or (z) effect any combination thereof. In any case, the purchaser will be liable for any deficiency, any and all costs, handling charges, late charges, expenses of both sales, our commissions on both sales at our regular rates, legal fees and expenses, collection fees and incidental damages. We may, in our sole discretion, apply any proceeds of sale then due or thereafter becoming due to the purchaser from us or any affiliated company, or any payment made by the purchaser to us or any affiliated company, whether or not intended to reduce the purchaser's obligations with respect to the unpaid lot or lots, to the deficiency and any other amounts due to us or any affiliated companies. In addition, a defaulting purchaser will be deemed to have granted and assigned to us and our affiliated companies, a continuing security interest of first priority in any property or money of or owing to such purchaser in our possession, custody or control or in the possession, custody or control of any of our affiliated companies, in each case whether at the time of the auction, the default or if acquired at any time thereafter, and we may retain and apply such property or money as collateral security for the obligations due to us or to any affiliated company of ours. We shall have all of the rights accorded a secured party under the New York Uniform Commercial Code. You hereby agree that Sotheby's may file financing statements under the New York Uniform Commercial Code without your signature. Payment will not be deemed to have been made in full until we have collected good funds. Any claims relating to any purchase, including any claims under the Conditions of Sale or Terms of Guarantee, must be presented directly to Sotheby's. In the event the purchaser fails to pay any or all of the total purchase price for any lot and Sotheby's nonetheless elects to pay the Consignor any portion of the sale proceeds, the purchaser acknowledges that Sotheby's shall have all of the rights of the Consignor to pursue the purchaser for any amounts paid to the Consignor, whether at law, in equity, or under these Conditions of Sale. Unless exempted by law, the purchaser will be required to pay the combined New York State and local sales tax, any applicable compensating use tax of another state, and if applicable, any federal luxury or other tax, on the total purchase price. The rate of such combined tax is 8.875% in New York City and ranges from 7% to 8.625% elsewhere in New York. It is the purchaser's sole responsibility to identify and obtain any necessary export, import, firearm, endangered species or other permit for the lot. Any notices in the sale e-catalogue reflect Sotheby's reasonable opinion at the time of cataloguing and are for bidders' general guidance only; Sotheby's and the Consignor make no representations or warranties as to whether any lot is or is not subject to export or import restrictions or any embargoes. These Conditions of Sale and Terms of Guarantee, as well as bidders', the purchaser's and our respective rights and obligations hereunder, shall be governed by and construed and enforced in accordance with the laws of the State of New York. By bidding at an auction, all bidders including the purchaser, shall be deemed to have consented to the exclusive jurisdiction of the state courts of, and the federal courts sitting in, the State of New York. All parties agree, however, that Sotheby's shall retain the right to bring proceedings in a court other than the state and federal courts sitting in the State of New York. We are not responsible for the acts or omissions in our packing or shipping of purchased lots or of other carriers or packers of purchased lots, whether or not recommended by us. Packing and handling of purchased lots is at the entire risk of the purchaser. In no event will the aggregate liability of Sotheby's and the consignor to a purchaser exceed the purchase price actually paid. Sotheby's will not be responsible for any errors or failures to execute bids placed online or for any errors or omissions in connection therewith including, without limitation, errors or failures caused by (i) a loss of connection to the internet or the Sotheby's or Invaluable's Online Platform software by either Sotheby's or the client; (ii) a breakdown or problem with Sotheby's or Invaluable's Online Platform software; or (iii) a breakdown or problem with a client's Internet connection, mobile network or computer. The Consumer Rights Directive (Directive 2011/83/EU) and related regulations implemented by the European Union ("EU") member states (the "Regulations") give bidders based within an EU member state (an "EU Bidder") who purchase goods and services online or otherwise "at a distance" certain cancellation rights under the Regulations. Under the Regulations, an EU Bidder who purchases property during the sale has the right to cancel the contract (provided that such contract is a distance contract or an off-premises contract for the purposes of the Regulations) for any reason and without incurring liability within a period of fourteen days after the day on which the property comes into the physical possession of either the EU Bidder or a person identified by the EU Bidder to take possession of the property (but not the carrier of the property) (the "Goods Cancellation Period"). Under the Regulations, an EU Bidder who purchases shipping services from Sotheby's (the "Shipping Services") has the right to cancel the Shipping Services for any reason within a period of fourteen days after the date on which the contract to provide the Shipping Services is concluded (the "Services Cancellation Period") unless where at the EU Bidder's express request it has been agreed that the Shipping Services will begin during the Services Cancellation Period. In the case that the Shipping Services have begun prior to the expiry of the Services Cancellation Period, the EU Bidder will have the right to cancel the Shipping Services during the Services Cancellation Period until the Shipping Services have been fully performed after which point the cancellation right will no longer apply. If the EU Bidder lawfully cancels the contract for Shipping Services, Sotheby's will reimburse the EU Bidder all payments received from the EU Bidder in relation to the Shipping Services provided always that if the EU Bidder requested Sotheby's to begin the performance of the Shipping Services during the Services Cancellation Period, the EU Bidder will remain liable for Sotheby's reasonable costs. To exercise the right to cancel, the EU Bidder must inform Sotheby's, Inc. at: Post Sale Services, 1334 York Avenue, New York, NY 10021; telephone: +1 212 606 7444; fax: +1 212 606 7043; uspostsaleservices@sothebys.com; of its decision to cancel the contract for the purchase of property and/or for the provision of Shipping Services (as applicable) by a clear statement (e.g. a letter sent by post, fax or email) or using the model cancellation form, a copy of which can be obtained from Sotheby's, Inc. at the address noted above. In order to meet the cancellation deadline, the EU Bidder is required to send his/her communication concerning the exercise of the cancellation right (i) in relation to a purchase of property before the Goods Cancellation Period has expired and (ii) in relation to the provision of Delivery Services before the Services Cancellation Period has expired. Sotheby's, Inc. will make any applicable reimbursement using the same means of payment as the EU Bidder used for the initial transaction, unless the EU Bidder has expressly agreed otherwise and, in any event, the EU Bidder will not incur any fees as a result of the reimbursement. For bidders bidding through the Invaluable platform, in the event of any conflict between Invaluable's Terms and Conditions and Sotheby's Conditions of Sale and Terms of Guarantee, Sotheby's Conditions of Sale and Terms of Guarantee will control. As set forth below and in the Conditions of Sale, for all lots Sotheby's guarantees that the authorship, period, culture or origin (collectively, "Authorship") of each lot in this e-catalogue is as set out in the BOLD and CAPITALIZED type in the initial heading following the lot number in the lot level e-catalogue description of the lot, as amended by notices posted on the Sotheby's and Invaluable websites. Purchasers should refer to the Glossary of Terms, if any, for an explanation of the terminology used in the Bold and Capitalized type heading and the extent of the Guarantee. Sotheby's makes no warranties whatsoever, whether express or implied, with respect to any material in the e-catalogue other than that appearing in the Bold and Capitalized heading and subject to the exclusions below. In the event Sotheby's in its reasonable opinion deems that the conditions of the Guarantee have been satisfied, it shall refund to the original purchaser of record the hammer price and applicable Buyer's Premium paid for the lot by the original purchaser of record. This Guarantee is provided for a period of five (5) years from the closing date of the relevant auction, is solely for the benefit of the original purchaser of record at the auction and may not be transferred to any third party. To be able to claim under this Guarantee of Authorship, the original purchaser of record must: (i) notify Sotheby's in writing within three (3) months of receiving any information that causes the original purchaser of record to question the accuracy of the Bold and Capitalized type heading, specifying the lot number, closing date of the auction at which it was purchased and the reasons for such question; and (ii) return the Lot to Sotheby's at the original selling location in the same condition as at the closing date of sale to the original purchaser of record and be able to transfer good title to the Lot, free from any third party claims arising after the date of such sale. Sotheby's has discretion to waive any of the above requirements. Sotheby's may require the original purchaser of record to obtain at the original purchaser of record's cost the reports of two independent and recognized experts in the field, mutually acceptable to Sotheby's and the original purchaser of record. Sotheby's shall not be bound by any reports produced by the original purchaser of record, and reserves the right to seek additional expert advice at its own expense. It is specifically understood and agreed that the rescission of a sale and the refund of the original purchase price paid (the successful hammer price, plus the buyer's premium) is exclusive and in lieu of any other remedy which might otherwise be available as a matter of law, or in equity. Sotheby's and the Consignor shall not be liable for any incidental or consequential damages incurred or claimed, including without limitation, loss of profits or interest. The following will help in understanding the auction buying process as well as some of the terms commonly used in an auction e-catalogue. All bidders should read the Conditions of Sale and Terms of Guarantee in this e-catalogue, as well as the Glossary or any other notices. By bidding in the auction, bidders are bound by the Conditions of Sale and Terms of Guarantee, as amended by notices, which together form the sale contract among Sotheby's, the seller (consignor) of the lot and any bidders, including the successful bidder (purchaser). Lots with this symbol are offered without reserve and will be sold to the highest bidder acknowledged by the Sotheby's and Invaluable online bidding systems who has submitted a bid equal to or in excess of $50.00. If a bid of at least $50.00 is not received, potential bidders may contact Sotheby's after the auction has ended to make an offer. The seller of lots with this symbol has been guaranteed a minimum price from one auction or a series of auctions. This guarantee may be provided by Sotheby's or jointly by Sotheby's and a third party. Sotheby's and any third parties providing a guarantee jointly with Sotheby's benefit financially if a guaranteed lot is sold successfully and may incur a loss if the sale is not successful. If the Guaranteed Property symbol for a lot is not included in the printing of the auction catalogue, a pre-sale or pre-lot announcement will be made indicating that there is a guarantee on the lot. Lots with this symbol indicate that Sotheby's owns the lot in whole or in part or has an economic interest in the lot equivalent to an ownership interest. Lots with this symbol indicate that a party has provided Sotheby's with an irrevocable bid on the lot that will be executed during the sale at a value that ensures that the lot will sell. The irrevocable bidder, who may bid in excess of the irrevocable bid, may be compensated for providing the irrevocable bid by receiving a contingent fee, a fixed fee or both. If the irrevocable bidder is the successful bidder, any contingent fee, fixed fee or both (as applicable) for providing the irrevocable bid may be netted against the irrevocable bidder's obligation to pay the full purchase price for the lot and the purchase price reported for the lot shall be net of any such fees. From time to time, Sotheby's may enter into irrevocable bid agreements that cover multiple lots. In such instances, the compensation Sotheby's will pay the irrevocable bidder is allocated to the lots for which the irrevocable bidder is not the successful purchaser. Under such circumstances, the total compensation to the irrevocable bidder will not exceed the total buyer's premium and other amounts paid to Sotheby's in respect of any lots for which the irrevocable bidder is not the successful bidder. If the irrevocable bid is not secured until after the printing of the auction catalogue, Sotheby's will notify bidders that there is an irrevocable bid on the lot by one or more of the following means: a pre-sale or pre-lot announcement, by written notice at the auction or by including an irrevocable bid symbol in the e-catalogue for the sale prior to the auction. From time to time, Sotheby's or any affiliated company may provide the irrevocable bidder with financing related to the irrevocable bid. If the irrevocable bidder is advising anyone with respect to the lot, Sotheby's requires the irrevocable bidder to disclose his or her financial interest in the lot. If an agent is advising you or bidding on your behalf with respect to a lot identified as being subject to an irrevocable bid, you should request that the agent disclose whether or not he or she has a financial interest in the lot. Lots with this symbol have been identified at the time of cataloguing as containing organic material which may be subject to restrictions regarding import or export. The information is made available for the convenience of bidders and the absence of the symbol is not a warranty that there are no restrictions regarding import or export of the Lot; bidders should refer to Condition 14 of the Conditions of Sale. Please also refer to the section on Endangered Species in the information on Buying at Auction. Lots with this symbol may, in our opinion, require special handling or shipping services due to size or other physical considerations. Bidders are advised to inspect the lot and to contact Sotheby's prior to the sale to discuss any specific shipping requirements. Each lot in the e-catalogue is given a low and high estimate, indicating to a prospective buyer a range in which the lot might sell at auction. 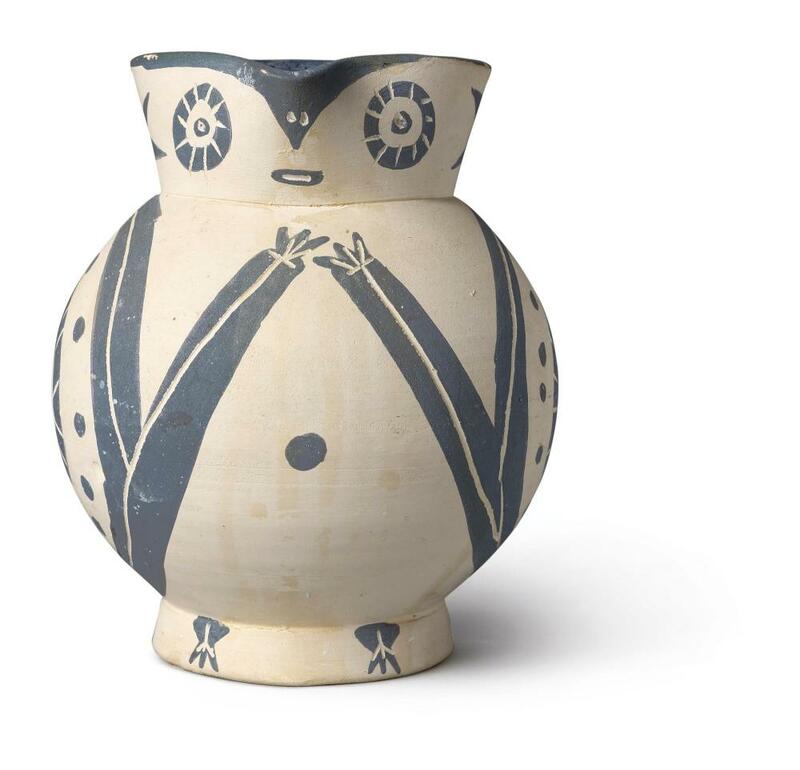 When possible, the estimate is based on previous auction records of comparable pieces. The estimates are often determined several months before a sale and are therefore subject to change upon further research of the property, or to reflect market conditions or currency fluctuations. Estimates should not be relied upon as a representation or prediction of actual selling prices. In certain circumstances, Sotheby's may publish in the e-catalogue the history of ownership of a work of art if such information contributes to scholarship or is otherwise well known and assists in distinguishing the work of art. However, the identity of the seller or previous owners may not be disclosed for a variety of reasons. For example, such information may be excluded to accommodate a seller's request for confidentiality or because the identity of prior owners is unknown given the age of the work of art. Prospective bidders may be interested in specific information not included in the e-catalogue description of a lot. For additional information, please contact either a Sotheby's specialist or Sotheby's Client Services Department at enquiries@sothebys.com. Viewing Sotheby's website will state whether there is an exhibition of the auction property. Where an exhibition is held, the exhibition will be held during the dates indicated on the Sotheby's website, and you will have the opportunity to view, inspect and evaluate the property yourself, or with the help of a Sotheby's specialist. Where no exhibition or only a partial exhibition is held, the property not exhibited will be available for viewing by appointment only at our New York premises, and you can schedule a viewing as indicated on the Sotheby's website. Notices amend the e-catalogue description of a lot after our e-catalogue has been published on the Sotheby's and Invaluable websites. Please take note of them. Unless otherwise noted in the e-catalogue or by a notice posted on the Sotheby's and Invaluable websites, Sotheby's acts as agent on behalf of the seller and does not permit the seller to bid on his or her own property. If you would like to bid, you must register on the Sotheby's or Invaluable website. Sotheby's reserves the right, in our sole discretion, to refuse your registration or participation in the auction or to revoke your permission to participate before, during or after the sale. All lots sold will be invoiced to the name and address registered for the bid and cannot be transferred to other names and addresses. Sotheby's reserves the right to refuse to accept payment from a source other than the buyer of record. For information about registering to bid please visit the Sotheby's or Invaluable website. The United States maintains economic and trade sanctions against targeted foreign countries, groups and organizations. There may be restrictions on the import into the United States of certain items originating in sanctioned countries, including Burma, Cuba, Iran, North Korea and Sudan. The purchaser's inability to import any item into the US or any other country as a result of these or other restrictions shall not justify cancellation or rescission of the sale or any delay in payment. Please check with the specialist department if you are uncertain as to whether a lot is subject to these import restrictions, or any other restrictions on importation or exportation. For lots which are sold, the last price for a lot noted by the Sotheby's and Invaluable online bidding systems is the hammer price. A buyer's premium will be added to the hammer price and is payable by the purchaser as part of the total purchase price. The buyer's premium will be the amount stated in the Sotheby's Conditions of Sale. If your bid is successful, your invoice will be e-mailed to you. The final price is determined by adding the buyer's premium to the hammer price on a per-lot basis. Sales tax, where applicable, will be charged on the entire amount. Payment is due in full immediately after the sale. However, under certain circumstances, Sotheby's may, in its sole discretion, offer bidders an extended payment plan. Such a payment plan may provide an economic benefit to the bidder. Credit terms should be requested at least one business day before the sale. However, there is no assurance that an extended payment plan will be offered. Please contact Post Sale Services or the specialist in charge of the sale for information on credit arrangements for a particular lot. Please note that Sotheby's will not accept payments for purchased lots from any party other than the purchaser, unless otherwise agreed between the purchaser and Sotheby's prior to the sale. Sotheby's accepts payment by credit card for Visa, MasterCard, and American Express only. Credit card payments may not exceed $50,000 per sale. Payment by credit card may be made (a) online at https://www.sothebys.com/en/invoice-payment.html, (b) by calling in to Post Sale Services at +1 212 606 7444, or (c) in person at our premises. Sotheby's accepts personal, certified, banker's draft and cashier's checks drawn in US Dollars (made payable to Sotheby's). While personal and company checks are accepted, property will not be released until such checks have cleared, unless you have a pre-arranged check acceptance agreement. Application for check clearance can be made through the Post Sale Services. New York sales tax is charged on the hammer price, buyer's premium and any other applicable charges on any property picked up or delivered in New York State, regardless of the state or country in which the purchaser resides or does business. Purchasers who wish to use their own shipper who is not a considered a "common carrier" by the New York Department of Taxation and Finance will be charged New York sales tax on the entire charge regardless of the destination of the property. Please refer to "Information on Sales and Use Tax Related to Purchases at Auction" in the back of the e-catalogue. Once your payment has been received and cleared, property may be released. Unless otherwise agreed by Sotheby's, all purchases must be removed by the 30th calendar day following a sale. a shipping quotation or have any questions about the services we offer please contact us. As a courtesy to purchasers who come to Sotheby's to collect property, Sotheby's will assist in the packing of lots, although Sotheby's may, in the case of fragile articles, choose not to pack or otherwise handle a purchase. The Bill of Lading must include: the purchaser's full name, the full delivery address including the street name and number, city and state or city and country, the sale and lot number. Sotheby's will contact your shipper within 24 hours of receipt of the Bill of Lading to confirm the date and time that your property can be collected. Property will not be released without this confirmation and your shipper must bring the same Bill of Lading that was faxed to Sotheby's when collecting. All property releases are subject to the receipt of cleared funds. Please see the Conditions of Sale for further details. Certain property sold at auction, for example, items made of or incorporating plant or animal materials such as coral, crocodile, ivory, whalebone, tortoiseshell, rhinoceros horn, rosewood, etc., irrespective of age or value, may require a license or certificate prior to exportation and additional licenses or certificates upon importation to another country. Sotheby's suggests that buyers check on their government wildlife import requirements prior to placing a bid. Please note that the ability to obtain an export license or certificate does not ensure the ability to obtain an import license or certificate in another country, and vice versa. It is the purchaser's responsibility to obtain any export or import licenses and/or certificates as well as any other required documentation. In the case of denial of any export or import license or of delay in the obtaining of such licenses, the purchaser is still responsible for making on-time payment of the total purchase price for the lot. Although licenses can be obtained to export some types of endangered species, other types may not be exported at all, and other types may not be resold in the United States. Upon request, Sotheby's is willing to assist the purchaser in attempting to obtain the appropriate licenses and/or certificates. However, there is no assurance that an export license or certificate can be obtained. Please check with the specialist department or the Shipping Department if you are uncertain as to whether a lot is subject to these export/import license and certificate requirements, or any other restrictions on exportation. As part of Sotheby's efforts to support only the legitimate art market and to combat the illegitimate market in stolen property, Sotheby's has retained the Art Loss Register to check all uniquely identifiable items offered for sale in this e-catalogue that are estimated at more than the equivalent of US$1,500 against the Art Loss Register's computerized database of objects reported as stolen or lost. The Art Loss Register is pleased to provide purchasers with a certificate confirming that a search has been made. All inquiries regarding search certificates should be directed to The Art Loss Register, First Floor, 63-66 Hatten Garden, London EC1N 8LE or by email at artloss@artloss.com. The Art Loss Register does not guarantee the provenance or title of any e-catalogued item against which they search, and will not be liable for any direct or consequential losses of any nature howsoever arising. This statement and the ALR's service do not affect your rights and obligations under the Conditions of Sale applicable to the sale. You may bring your property directly to our galleries where our specialists will give you auction estimates and advice. There is no charge for this service, but we request that you telephone ahead for an appointment. Inspection hours are 9:30 am to 5 pm, Monday through Friday. If your property is not portable, or if you are not able to visit our galleries, you may bring in or send a clear photograph of each item. If you have a large collection, a representative selection of photographs will do. Please be sure to include the dimensions, artist's signature or maker's mark, medium, physical condition and any other relevant information. Our specialists will provide a free preliminary auction estimate subject to a final estimate upon first-hand inspection. Evaluations of property can also be made in your home. The fees for such visits are based on the scope and diversity of property, with travel expenses additional. These fees may be rebated if you consign your property for sale at Sotheby's. If there is considerable property in question, we can arrange for an informal "walkthrough." Sotheby's also offers a range of other services to our clients beyond buying and selling at auction. These services are summarized below. Further information on any of the services described below can be found at sothebys.com. Sotheby's Valuations and Appraisals Services offers advice regarding personal property assets to trusts, estates, and private clients in order to help fiduciaries, executors, advisors, and collectors meet their goals. We provide efficient and confidential advice and assistance for all appraisal and auction services. Sotheby's can prepare appraisals to suit a variety of needs, including estate tax and planning, insurance, charitable contribution and collateral loan. Our appraisals are widely accepted by the Internal Revenue Service, tax and estate planning professionals, and insurance firms. In the event that a sale is considered, we are pleased to provide auction estimates, sales proposals and marketing plans. When sales are underway, the group works closely with the appropriate specialist departments to ensure that clients' needs are met promptly and efficiently. To better assist our clients, we have prepared the following information on Sales and Use Tax related to property purchased at auction. Virtually all State Sales Tax Laws require a corporation to register with the State's Tax Authorities and collect and remit sales tax if the corporation maintains a presence within the state, such as offices. In the states that impose sales tax, Tax Laws require an auction house, with a presence in the state, to register as a sales tax collector, and remit sales tax collected to the state. New York sales tax is charged on the hammer price, buyer's premium and any other applicable charges on any property picked up or delivered in New York, regardless of the state or country in which the purchaser resides or does business. Sotheby's is currently registered to collect sales tax in the following states: California, Colorado, Connecticut, Florida, Illinois, Maryland, Massachusetts, Minnesota, Missouri, New Jersey, New York, Ohio, Pennsylvania, Texas, and Washington. For any property collected or received by the purchaser in New York City, such property is subject to sales tax at the existing New York State and City rate of 8.875%. If the property is delivered into any state in which Sotheby's is registered, Sotheby's is required by law to collect and remit the appropriate sales tax in effect in the state where the property is delivered. Property collected from Sotheby's New York premises by a common carrier hired by the purchaser for delivery at an address outside of New York is not subject to New York Sales Tax, but if the property is delivered into any state in which Sotheby's is registered, Sotheby's is required by law to collect and remit the appropriate sales tax in effect in the state where the property is delivered. New York State recognizes shippers such as the United States Postal Service, United Parcel Service, FedEx, or the like as "common carriers". If a purchaser hires a shipper other than a common carrier to pick up property, Sotheby's will collect New York sales tax at a rate of 8.875% regardless of the ultimate destination of the goods. If a purchaser utilizes a freight-forwarder who is registered with the Transportation Security Administration ("TSA") to deliver property outside of the United States, no sales tax would be due on this transaction. Sotheby's is not required to collect sales tax on property delivered to states other than those listed above. If the property is delivered to a state where Sotheby's is not required to collect sales tax, it is the responsibility of the purchaser to self-assess any sales or use tax and remit it to taxing authorities in that state. Sotheby's is not required to collect sales tax for property delivered to the purchaser outside of the United States. Regardless of where the property is subsequently transported, if any framing or restoration services are performed on the property in New York, it is considered to be a delivery of the property to the purchaser in New York, and Sotheby's will be required to collect the 8.875% New York sales tax. Most states that impose sales taxes allow for specified exemptions to the tax. For example, a registered re-seller such as a registered art dealer may purchase without incurring a tax liability, and Sotheby's is not required to collect sales tax from such re-seller. The art dealer, when re-selling the property, may be required to charge sales tax to its client, or the client may be required to self-assess sales or use tax upon acquiring the property. As sales tax laws vary from state to state, Sotheby's recommends that clients with questions regarding the application of sales or use taxes to property purchased at auction seek tax advice from their local tax advisors. Once your payment has been received and cleared, property may be released. Unless other-wise agreed by Sotheby's, all purchases must be removed by the 30th calendar day following a sale. If you are using your own shipper to collect property from Sotheby's, please provide a letter of authorization and kindly instruct your shipper that they must provide a Bill of Lading prior to collection. Both documents must be sent to Post Sale Services prior to collection. Certain property sold at auction, for example, items made of or incorporating plant or animal materials such as coral, crocodile, ivory, whalebone, tortoiseshell, rhinoceros horn etc., irrespective of age or value, may require a license or certificate prior to exportation and additional licenses or certificates upon importation to another country. Sotheby's suggests that buyers check on their government wildlife import requirements prior to placing a bid. Please note that the ability to obtain an export license or certificate does not ensure the ability to obtain an import license or certificate in another country, and vice versa. It is the purchaser's responsibility to obtain any export or import licenses and/or certificates as well as any other required documentation. In the case of denial of any export or import license or of delay in the obtaining of such licenses, the purchaser is still responsible for making on-time payment of the total purchase price for the lot.